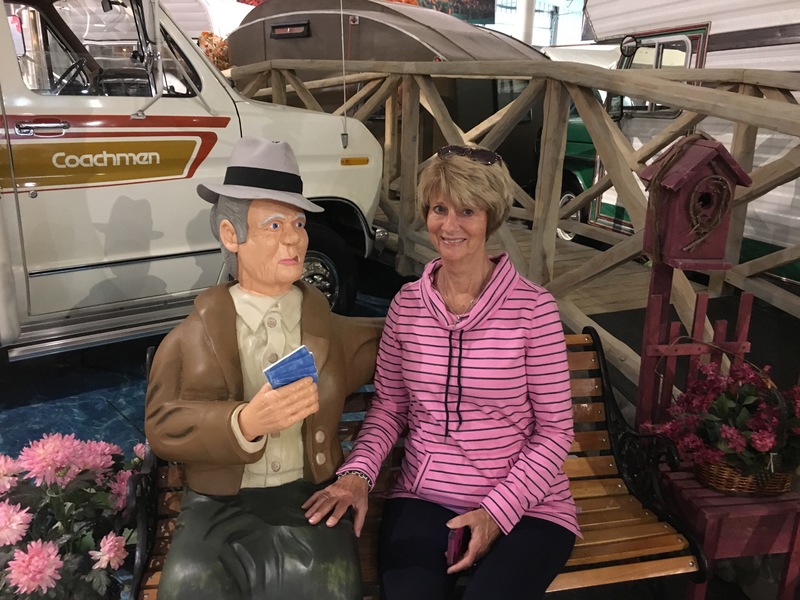 Nappanee – Let's Go RVing! When I know I have to get up extremely early for something I rarely sleep well the night before and last night certainly was a prime example of that. Knowing we had to get up at 5:00 to be ready for the techs at 6:00 we were both awake at 4:00. Let me tell you folks, that makes a long day. After the techs arrived and we told them our concerns they took our coach saying they would call around 8:00 with estimates of time and costs. Jerry and I then took off for Gary, Indiana where we thought the SMI headquarters were located. I looked at the car and told Jerry that it specifically said that it was located in Newburg, Indiana which was about 300 miles away. I don’t know where Jerry got Gary from but I feel sure that someone told him that because he had never heard of Gary, Indiana before. To make a long story short – or in the case an hour longer, we headed for Gary. When we realized that we had moved over to Central Time and we had an extra hour we decided to look for an IHOP for breakfast. We located one in Merrillsburg about 11 miles from Gary and had a nice breakfast. We had been talking about going out for breakfast one day but I surely didn’t plan on going that early in the morning. We finally were able to call SMI and sure enough someone had given us erroneous information and SMI was not in Gary but in Newburg. Well, it was a pretty morning ride! While we were at breakfast the tech from Newmar called and gave the estimates for each concern we had. We agreed to have everything done except floor repair. That was going to cost about $1500 and it’s purely cosmetic. Heck, it probably wouldn’t cost much more to get an entire new floor! They were not sure if they would be finished with the repairs today or not but should be by Wednesday or Thursday. Oh well – we’ll just have to see. Since we had the entire day before us we decided to go on to Shipshewana which was on my original plan. It’s a little over 100 miles from Gary but only 40 from Nappanee. Needless to say we were both a bit tired and it was only 10:00 but Newmar had said they would have the coach back in our parking place by 2:30 so a “short” drive of 40 miles and we’d be napping Tuesday afternoon. If they don’t complete the repairs that means another out of the coach by 6:00 morning. Our first stop was the Menno-Hof Building which told the story of the Amish, the Mennonites and Hutterites. 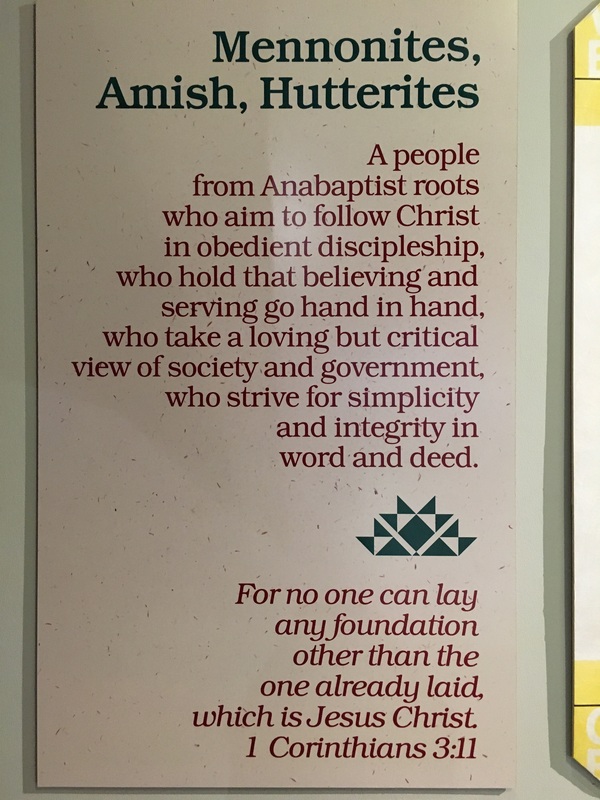 They all were all originally a part of the Anabaptist movement which started as a protest against the baptizing of all children. The Anabaptists believed that baptism should follow a confession of faith to Jesus Christ. Eventually the Hutterites split from the movement as they elected to live communally sharing in everything. 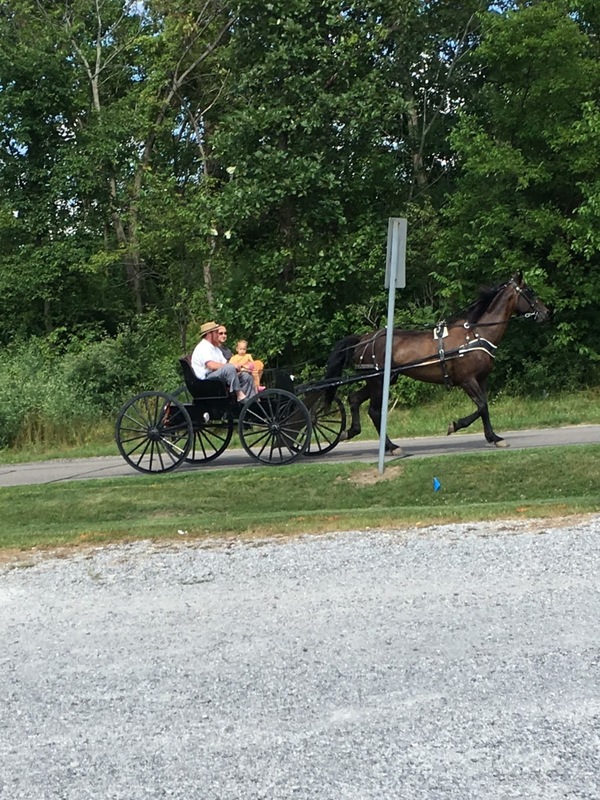 The Amish later split from the Mennonites because they believed in a more simple life. They felt that possessions contributed to pride. Cars divided families so they continued to use horses and buggies. The Amish also continued to wear clothing that was drab in color. The women wore dresses of a length below their knee and caps on their heads an they continue to make all of the clothes. Boy, it’s a good thing we aren’t Amish! With my sewing skills our clothes would be falling off especially the ones held together with straight pins. One of the main premises of the faith is service to others. If a neighbor needs assistance they are always eager to help. Another difference in the Mennonite and Amish is their place of worship. Although the Mennonites worship in a church the Amish continue to worship in their homes. They have a large wagon that moves the pews from home to home every other week which is when they have their services. Our next stop was Yoder’s Cheese and Meats where we found nuts made in Henderson NC! Before buying anything we walked out to the flea market. There was probably nothing that anyone could want that couldn’t be found there but we settled for corn, cukes and green beans. On our way back through Yoder’s we picked up some beets and jalapeño yogurt cheese. We were planning to have steak for dinner and Yoder’s had some pretty steaks – $12.99 a pound. We passed! We had an early dinner since we had skipped lunch and boy was it good – steak that was so thick and juicy, corn on the cob and potatoes we had bought from Hebert’s in Louisiana. Afterward we spent the rest of the evening talking with a couple who own a Canyon Star and had just gone full time. Our Canyon Star is the 3953 and theirs is a 3914. When we were looking I really wanted a 3914 but we couldn’t find one so we ended up with the 3953. Thank goodness. Had I seen a 3914 I wouldn’t have liked it. While it appears to have more room in the den/kitchen area the bedroom is quite small and there is only one bath. I am extremely glad we went with the 3953. As soon as we came in we got ready for bed as we knew that 5:00 would be coming soon. Unlike the night before when we worried about waking up early thus not sleeping very well we both slept well. Well, I did until the person next to us arrived at 12:30 am and while backing into his site his coach was sounding the beeping alarm. At first I didn’t realize what it was so I jumped up and walked around to try to determine which of our alarms was going off only to determine that it was the coach next door. Jerry never budged! Well we did it. We spent a week, well nearly a week, 6 days in the coach with only electric hook-up. When we arrived we had a full water tank and empty gray and black tanks and we made it. Since our sensors don’t work correctly we really never knew how full our tanks were or how much water we had. When Jerry filled up the water tank before we left the gauge indicated that it was 1/3 full and it was 1/3 full all week! Plans were to pull out of our parking space by 9:00 and as directed get on pavement to hook up the car. We actually got it all done and pulled out of the fairgrounds at 8:50, an absolute record for us. For a change it was a sun shiny day and an easy drive but Highway 31 to Nappanee has a lot of construction going on and not a minute too soon. It was possibly one of the worst highways we’ve traveled on. Fortunately we got to Newmar in Nappanee about 11:15 and got the last FHU parking place. We had already decided that if we couldn’t get a full hookup we’d find a campground. Not only did our tanks need emptying we also needed to wash clothes. In view of that I used our AllStays app to locate a campground that was in the area but fortunately we didn’t have to use it. 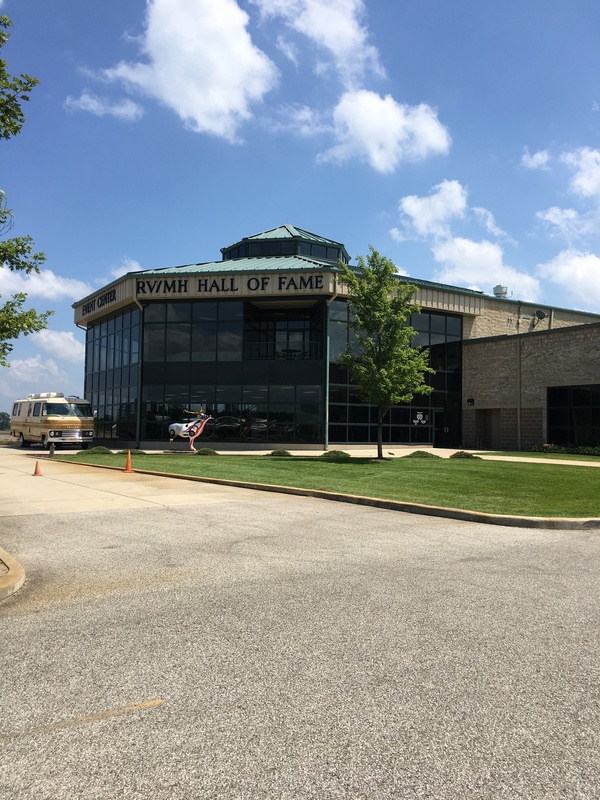 Newmar has a number of places to park RV’s but only a small number with full hookups. Nearly every place we looked though was full as I think many of the folks at the FMCA rally had the same idea we had and headed to Nappanee first thing Sunday morning. We parked next to another Canyon Star and Jerry visited with him for a while. While he was doing that I began cleaning, getting rid of all of the mud we had tracked in during the rainy week. Sweeping, vacuuming, mopping, dusting – all of it but you know, it doesn’t take very long when you only have 300 square feet. When Jerry came in we decided to find a fast food place for lunch since we didn’t have anything we could prepare plus we needed to go grocery shopping and get gas for the car. We ended up at Amish Acres, a tourist attraction not far from Newmar. They had an ice cream shop, a cheese shop, a fudge shop, a farm tour and a restaurant (definitely not fast food). We headed toward the restaurant and it was like any other buffet, nothing really special but nearly $40. We probably should have gone to the grocery store first! After we got back to the coach we both took naps. I can’t believe I was so tired but we have been on the go all day and night for a week. Afterward we walked around the “campground” and ended up bringing our chairs and visiting with some folks. One of the guys, Bob from Chapel Hill, Texas also has a Canyon Star. He showed me how he prevented his floors from getting damage from the rollers when the slides come in. He cut foam shelf paper from the Dollar Store into 12” inch squares and lets the slides come over them. We will definitely try that! We also visited with a couple from Tennessee and the guy actually knew someone that I had known years ago. Small world! As I was sitting here typing this I just saw an Amish buggy ride by and two girls on bicycles behind it. They were going pretty fast! A very different scene than what I usually see out of our window!